We call that ground floor one bedroom apartment the “old house.” It was the first home we had made for ourselves upon immigrating to the US in 1978. It was the home I was born into. That’s me, the sole birthright American in my family. My sisters and I shared the one room in this tenement style pre-war apartment. Between a queen and a bunk bed, the only other necessity was the dial TV. It wasn’t connected to cable, so we watched prime time television in the evenings on it. Our parents slept in the old pantry off the kitchen. It fit a queen bed perfectly and thankfully. I don’t know how else the 6 of us would have fit in there. It was about fitting ourselves into that space that made it palatable or perhaps we just didn’t know any better. Somehow we did it for close to a decade, fitting in to any crevice we could find, a parking spot, a seat on the 1 California toward Chinatown, or an available washing machine at Cindy’s Laundromat. We didn’t fit right in (we still don’t. ), but we found a place to fit. Through the years..Our living room and our bevy of electronics on display. And fishtanks. 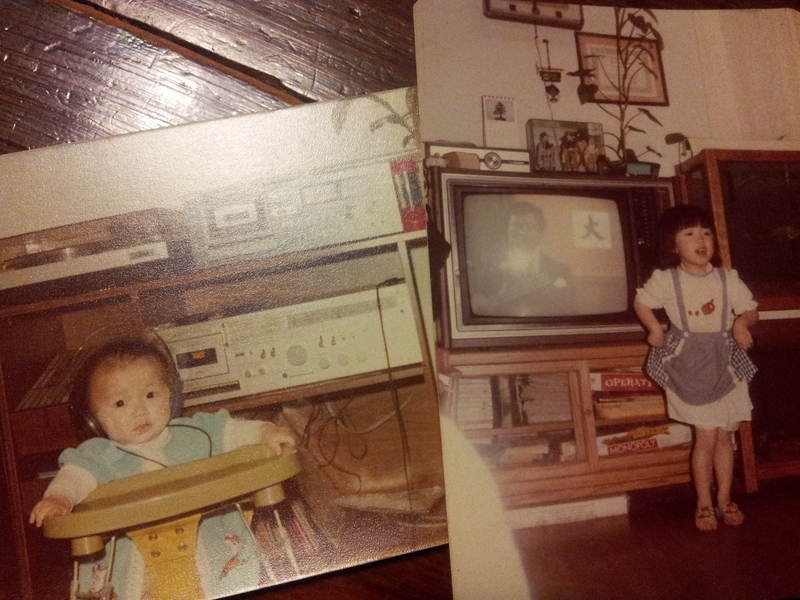 That’s me at around 1 and 4. Vintage games! Operation! Doing laundry was always a family affair, something to do to leave the confines of our apartment, something to keep us busy. We’d bring the clothes down Clay street to the laundromat at the corner on Hyde. There we’d settle in, the smell of powdered detergent adding to another contrast to our usual settings. Folding the laundry was an assembly line of sorts. My sisters would lay the warm clothes in front of their laps, the television tuned to Solid Gold or Wild, Wild World of Animals, while they would fold in silence, eyes riveted to the TV, the centerpiece of our living room. Then my sisters would fit the folded clothes back into the family wardrobe we all shared, which was placed in the room we shared. All the clothes we wore fit into this shared wardrobe. It was divided by 4 main quadrants. The top two were reserved for items that would be hung. The bottom two were shared by my sisters and me. One of the quadrants was divided to allow for my father to fold his undershirts. That was all he used. This wardrobe now sits, quietly and undisturbed, fitting neatly in my parents’ garage, a far cry from the daily hullabaloo it used to endure every morning on a school day. It carries the contents of the excess and the seasonal. I think my dad uses it now to store his luggage. It also sits next to their washing machine.